This week, the letter “F” is dedicated to the memory of a true friend and advocate for Middle Atlantic Archaeology, Fred Assmus. 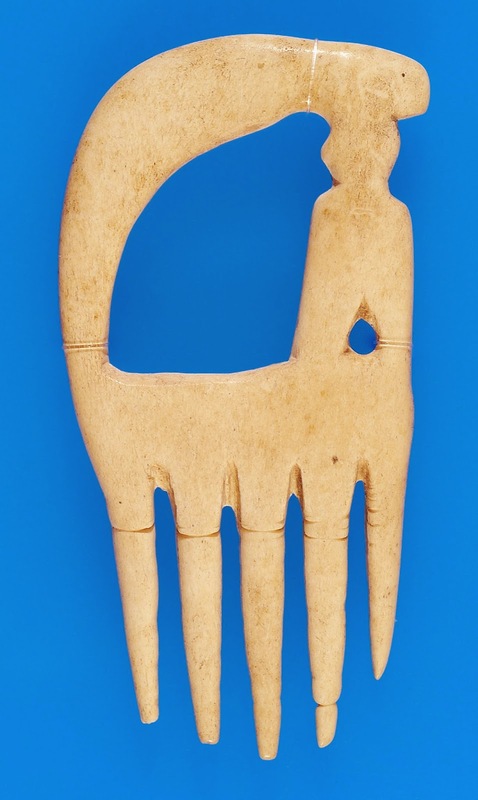 Sharon, Fred’s loving wife and partner of thirty-three years, donated the Assmus Collection in the summer of 2013 to The State Museum of Pennsylvania, Section of Archaeology. Transported in over sixty boxes and three travel display cases, the collection embodies over fifty years of volunteer service to avocational archaeology associations in the tri-state region of Pennsylvania, New York and New Jersey. In 2007, Fred was recognized as the Archey Award recipient by the Society of Pennsylvania Archaeology, Inc. (SPA) for his significant lifetime contribution to the society. He remained an active chapter member of the Incorporated Orange County Chapter of the New York State Archaeology Association (IOCCNYSAA), serving as a Trustee, program chair and as Treasurer in the later years of his life after relocating to Middletown, NY. 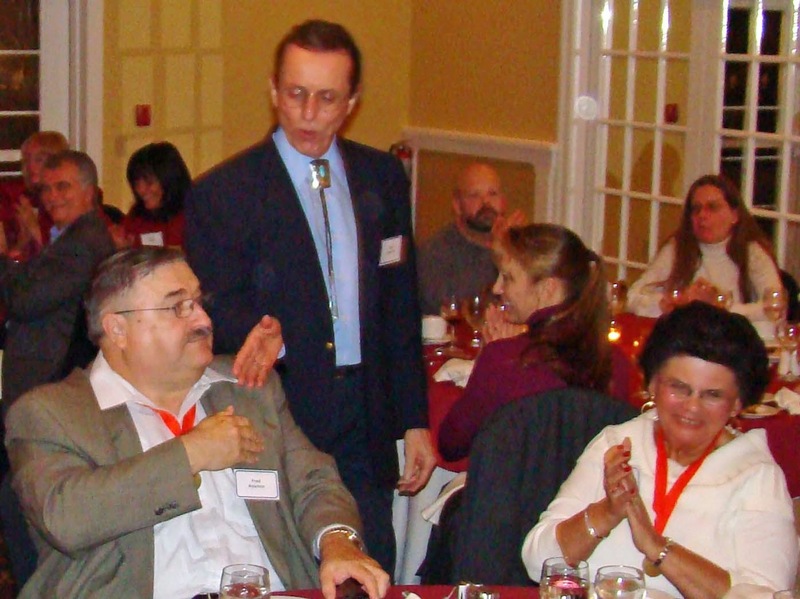 Fred and Sharon Assmus at the 2009 IOCCNYSAA annual banquet receiving an award, image courtesy of IOCCNYSAA. A husband and wife team, Sharon continues their legacy as a leading member in the IOCCNYSAA, acting as program chair for annual banquets, securing speakers for chapter meetings, and organizing community outreach events. She was elected to the office of correspondence secretary and has served in this position for numerous consecutive terms. Both Fred and Sharon have received many accolades for their years of service to the Orange County Chapter, and have been honored with membership in the “order of the trowel” at annual recognition events. Fred’s love for natural history and prehistoric cultures began at an early age when his family moved from Brooklyn, NY to the scenic town of Milford, PA in the Delaware Water Gap. As a young boy, Fred and his brother collected fossils and prehistoric artifacts from the banks of the Delaware River and its local tributaries. Bill Leiser, a high school teacher and member of the Lenape Chapter 12 of the SPA, took the budding amateur geologist and archaeologist under his wing when Fred was in his teens. Fred joined Mr. Leiser, David Werner, Lyman Vandermark, William DeGraw and family, and other chapter members to survey and excavate sites endangered by the Tocks Island Reservoir Project throughout the 1960s and 1970s. As he came of age, Mr. Assmus served as Treasurer for the Lenape Chapter for many years. 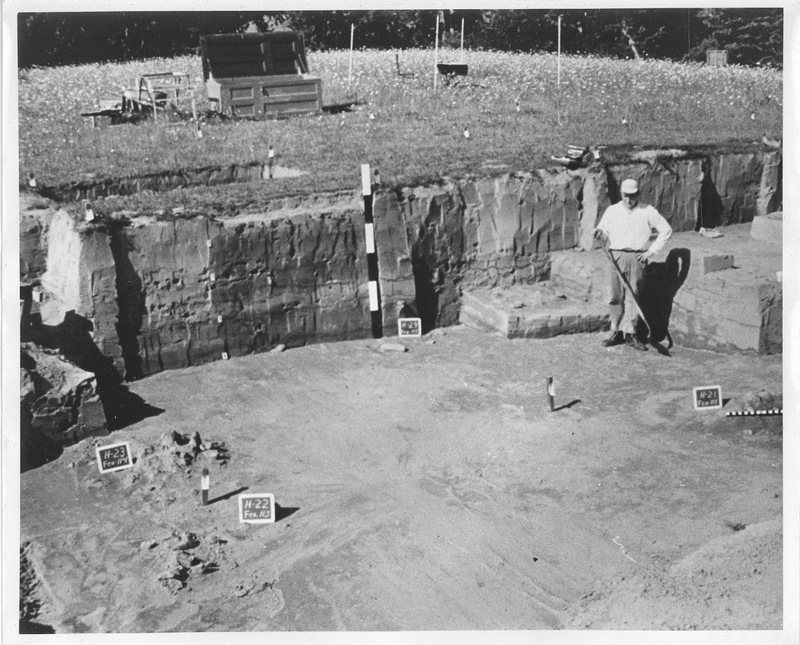 Fred Assmus excavating at the Zimmermann site in the 1960s. The bulk of the Assmus collection is from the Lenape Chapter’s undertakings in PikeCounty, Pennsylvania and Sussex County, New Jersey. Donated materials of significant number were received from the Zimmermann (36Pi14), Eshback (36Pi8), Snyder (Schneider- 36Pi40), Davenport (28Sx27), Minisink Island (28Sx28), Bell-Philhower/Bell-Browning (28Sx48), and Herring (28Sx428) sites. For more information regarding Lenape Chapter 12 excavations, the Werner Collection, and the Zimmermann site (36Pi14), visit our previous tribute to David Werner. We are currently processing the Assmus collection in the lab, ensuring its preservation for future research. Cataloged artifacts from the Assmus collection directly link to documents from Lenape Chapter excavations donated with the Werner and DeGraw collections in 2004 and 2006 respectively. Pictured above is a fishtail point (FS No. 169)Fred recovered from the Zimmermann Site (36Pi14) and its associated records. A proposed rotating exhibit in the Archaeology Gallery will also highlight the contributions of the Lenape Chapter 12 excavations. It is our intention to pay further tribute to Mr. Assmus by including several of his reconstructed prehistoric vessels in honor of his interest in steatite bowl morphology and Woodland Period pottery. The Garoga vessel above, recovered from Sussex County, New Jersey, was a particular favorite of Mr. Assmus. An example of Iroquoian influence in the Upper Delaware Valley, its presence supports the view that the Upper Delaware was a dynamic middle ground for cultural interactions between local Algonquian cultures and neighboring Iroquois prior to and during historic contact with European settlers (Stewart, 1993). 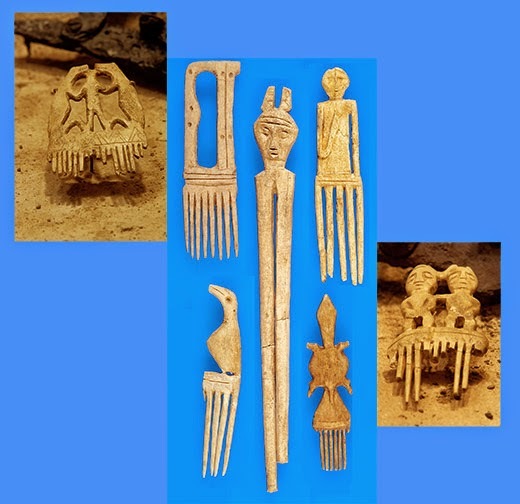 Garoga decorative motifs are ascribed cultural affiliation with proto-historic Iroquoian village sites in New York State. The type site, on which the Garoga cultural phase was defined by Ritchie (1965; Ritchie & Funk 1973), is located in the Mohawk Valley. 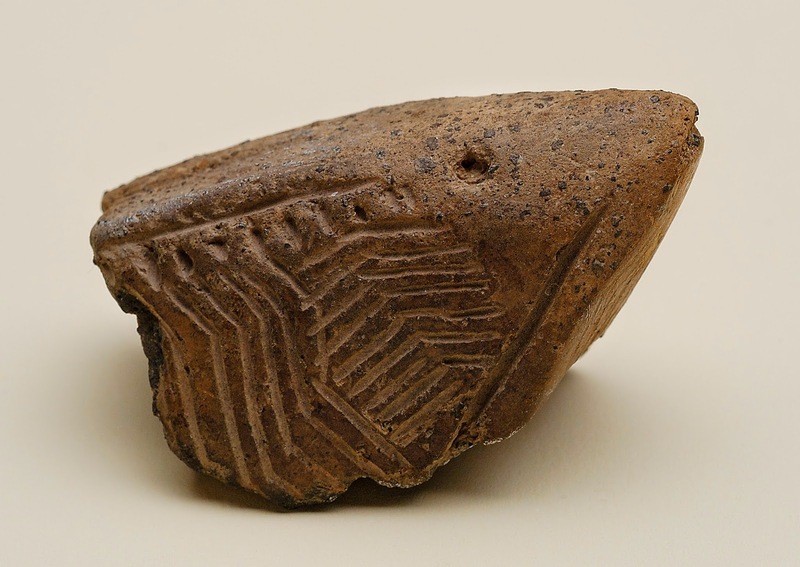 Pottery from the Upper Delaware Valley excavated from proto- Munsee contexts distinguishes itself from other Late Woodland Algonquian pottery found on sites in the lower Delaware Valley and coastal region. 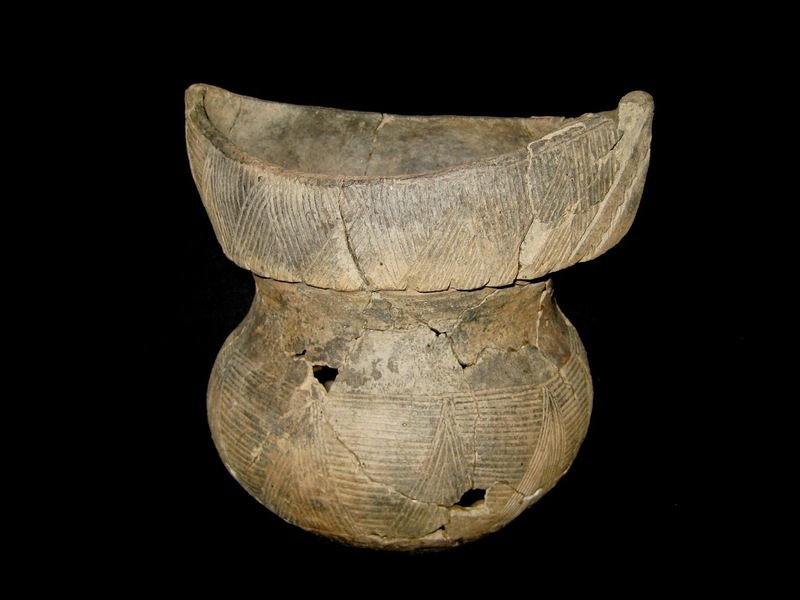 The stylistic choices of high, castellated collars and incised geometric designs—vessel morphology and decorative motifs that mimic Iroquois pottery types (Kraft, 1986: pp. 146-149; Leslie, 1973)—further suggest cross-cultural influence and interaction in the region between these two peoples of different linguistic origins. Fred shared these interests at chapter meetings, public outreach events and archaeology conferences, generously displaying his artifacts and speaking on topics of local prehistory whenever called upon. He was a further resource to professional archaeologists and historians, contributing his knowledge and providing images of his artifacts for publications. Amanda C. Batko, township historian at Montague, Sussex County, NJ, lists Mr. Assmus among her acknowledged mentors in her 2009 local historical account, Images of America, Montague. The Garoga vessel pictured above as well as a Munsee incised reconstructed vessel were featured in Kraft’s 1986 publication, The Lenape (Fig. 36h,f: 150). Additional vessels and stone tools from the Assmus collection are also pictured in Kinsey (1972), Archeology in the Upper Delaware Valley). 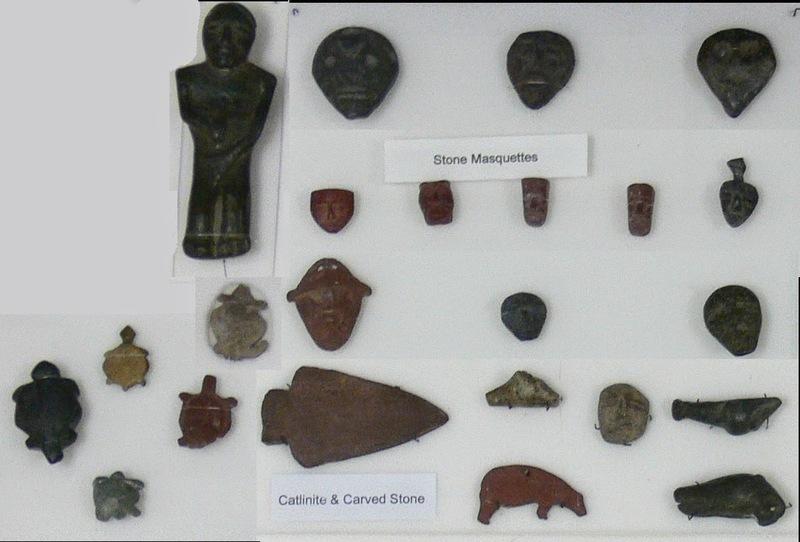 Link to our Pike County blog for more information relating to the archaeology of this collection and to see replicated figures from The Zimmermann site report (Werner 1972: 55-133). The Munsee incised rim from the Davenport site (Fig. 36.2) is part of the Assmus Collection. 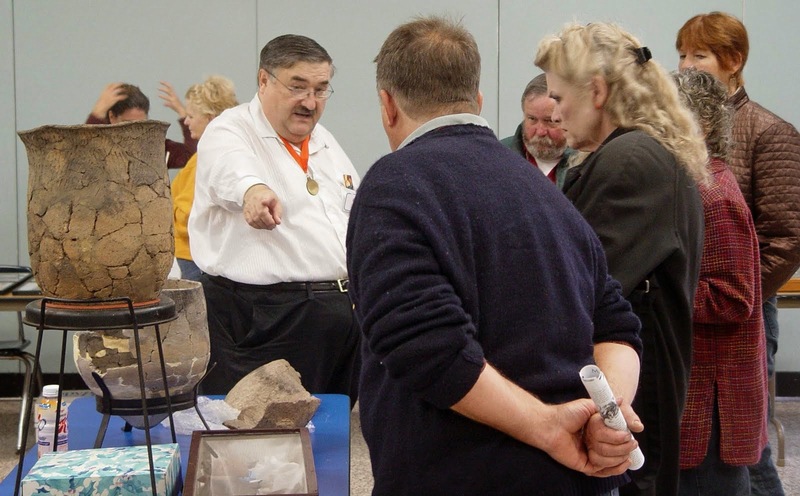 Fred Assmus sharing his collection at an IOCCNYSAA function in 2008, image courtesy of IOCCNYSAA. Fred’s warm hearted presence, enthusiasm and dedication to historic preservation are dearly missed in the archaeology community. We are proud to carry on his spirit and intent at The State Museum of Pennsylvania through the preservation and celebration of his collection and its significant contribution to our understanding of prehistoric cultures in the Upper Delaware Valley. 2009 Images of America, Montague. Arcadia Publishing. 1972 Archeology in the Upper Delaware Valley. Pennsylvania Historical and Museum Commission. 1983 The Lenape, Archaeology, History, and Ethnography. New Jersey Historical Society. 1973 Faces in Clay. T. Emmett Henderson. 1965 The Archaeology of New York State. The Natural History Press. 1973 Aboriginal Settlement Patterns in the Northeast. The New York State Museum and Science Service. 1993 Comparison of Late Woodland Cultures: Delaware, Potomac, and Susquehanna River Valleys, Middle Atlantic Region. Archaeology of Eastern North America 21:163-178. 1972 The Zimmermann Site. In Archeology in the Upper Delaware Valley by W. Fred Kinsey. pp. 55-130, The Pennsylvania Historical and Museum Commission. You have seen the word effigy in several of our blogs. We most often use it when referring to our departmental logo the Washington Boro Face effigy. likeness," related to effingere "mold, fashion, portray,"
The latter will be the focus of this blog. 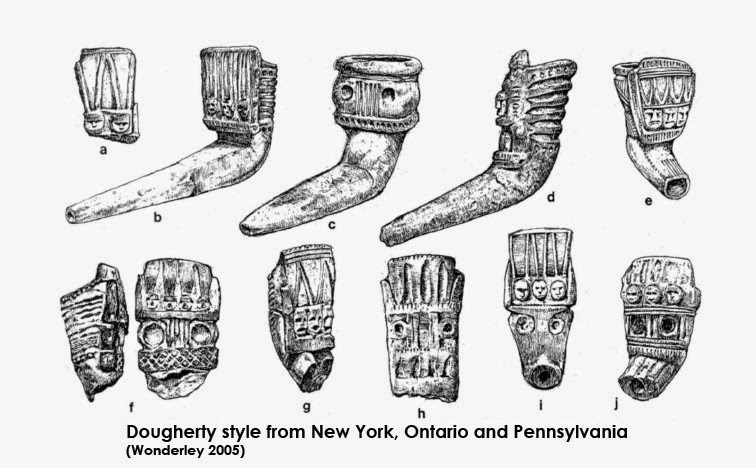 Most attempts to categorize and understand the effigy pipes of the Northeast begin by dividing them into one of three categories. The first is zoomorphic or animal effigies which can be subdivided into bird, reptile, mammal, and although rare, the rodent class (Nobel 1979). Of these, the bird group seems to dominate the numbers, “about half of the faunal representations on Ontario Iroquoian pipes” (Mathews 1981). Only about half of those (less than 50%) were able to be identified further, most of which were owls. 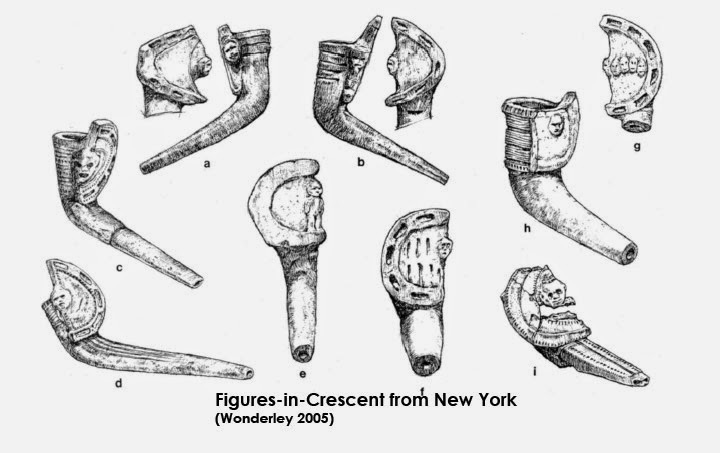 Similarly, 50% of the effigies on Susquehannock pipes are in the form of birds, “twice as frequent as mammals and reptiles” (Kinsey 1989). The difference is that the Susquehannock bird pipes are dominated by water birds (51%) vs. raptors (25%) (Kinsey 1989). Reptiles can be difficult to identify as they are “dizzyingly enigmatic” (Mathews 1981), it appears that lizards/salamanders, coiled snakes and turtles are represented. Snakes are usually depicted coiled around the pipe bowl. 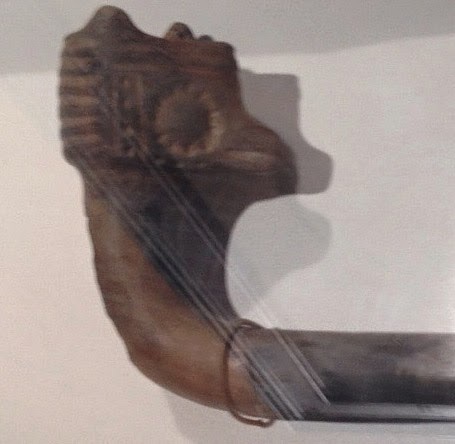 Some examples continue to coil down the stem of the pipe and yet others portray a head either above the rim head raised toward the smoker or in relief. Turtle effigies on pipes are rare, as are fish which are very rarely represented. Reptiles appear more frequently depicted in Susquehannock effigies (15%) as opposed to only (4%) among the Seneca examples studied by Kinsey (1989). That brings us to mammals, which are a bit puzzling. It seems that only two mammals are represented in the effigies of Ontario and New York, the bear and the wolf/canine/fox (Mathews 1981). According to Noble (1979) and Mathew (1981), it is difficult to differentiate between the wolf/canine/fox due the similar shape of the ears and snout. Noble (1979) also suggests a fourth class for the zoomorphic category as the rodent class. The rodent class is represented by a single beaver pipe from southern Ontario (Noble 1979 & Laidlaw 1913). One could just as easily eliminate the rodent class and include beaver with the other two mammals. It is interesting that so few mammals are represented and it makes one wonder why there are no deer (until the later rouletting designs), squirrel, raccoons, chipmunks, rabbits or mice. Approximately a quarter of the Susquehannock pipes represent mammals and unlike the northern counterparts, seem to include some short snouted mammals probably cougar/panther and perhaps even otters and martins (Kinsey 1989). Interestingly, it is also pointed out by Kinsey (1989) that unlike other cultures that choose economically important animals as zoomorphic representations, this was not the case with the Susquehannock. “Deer and elk accounted for 73% of the meat consumed by the Susquehannocks but these animals are never represented in Susquehannock and Seneca art!” (Kinsey 1989:84). 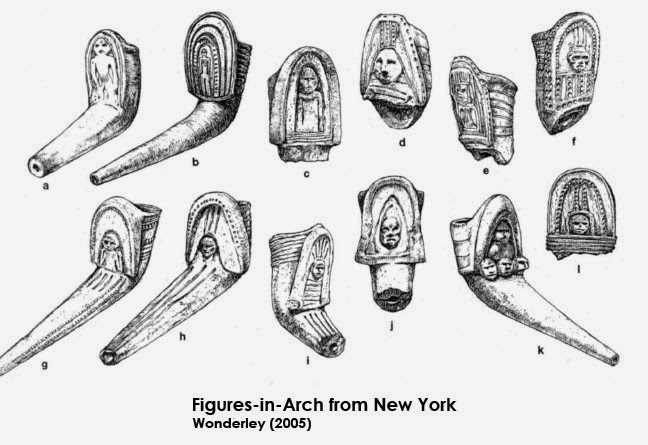 The second category are the human effigy pipes which are the most variable in form. 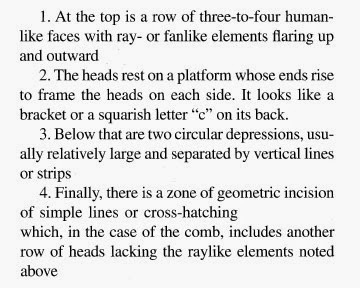 They can be subdivided any number of ways but perhaps the most useful place to start would be heads only (the more common focus) or heads and bodies (much less frequent) as suggested by Nobel (1979). Some have suggested a divergent chronology between animal effigies and human effigies. Suggesting that the human effigies seem to exhibit evolving attributes “that changed with the historical situation and its effects, such as contact and disease”; while the zoomorphic effigies seem to change very little over time, perhaps suggestive of a guardian spirit which remained constant (Mathews 1980). Comparatively, the Susquehannock and Seneca have equal numbers of human effigies (Kinsey 1989). Wonderley (2005) has subdivided the human effigies into four motifs. These include the “Roebuck type, which features a realistically modeled human face”. The Figure-in-Arch type which has many possible interpretations including “the niche of a saint, a boat, the Sky Dome” or could represent a birth scene, both literally as suggested by Hosbach (1992) or “possibly connected to the formation of the Iroquois Confederacy” (Wonderley 2005), this idea will be discussed later. This “ordered sequence of imagery” (Wonderley 2005:221) “[calls] to mind the developmental, linear syntax necessary to [a] narrative. Because the incidents of a story are temporally related – one preceding and being the precondition of the next – a tale [story] has to be presented in a certain sequence, not unlike this composition. It would not be surprising if this pipe imagery had a narrative referent, perhaps relating to a story performed, told, or contemplated.” We will come back to some of Wonderley’s interpretations later. The last category suggested by Nobel (1979) is the Duel effigy encompassing both zoomorphic and human forms. This category has also been referred to as “nonnaturlaistic representations” (Mathews 1981) and includes imagery of creatures not found in nature. So, what does it all mean??? 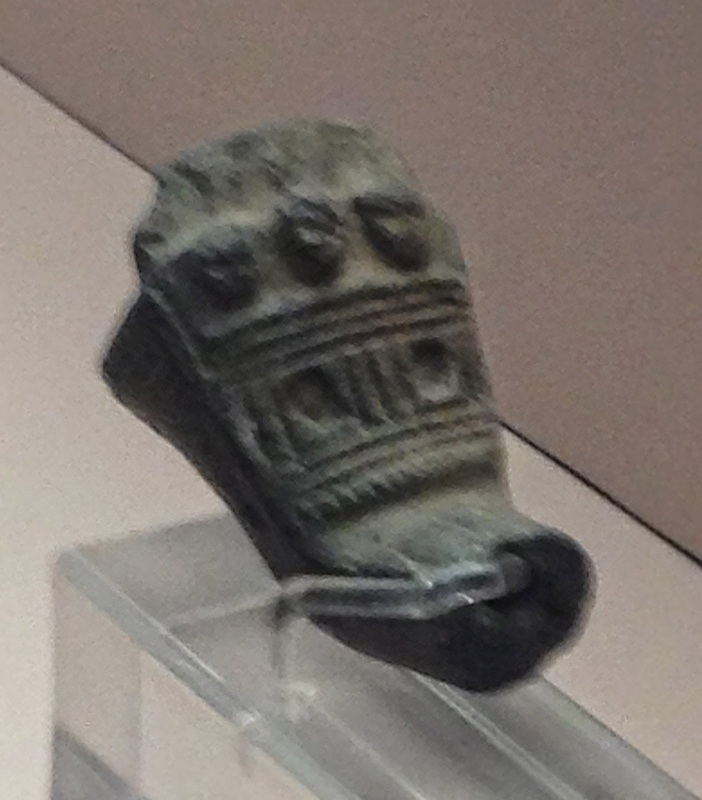 There have been many theories presented about the significance of similar effigies exhibited on pipes, combs, charms and some ceramics. They range from aesthetic “art for art’s sake”, to ceremonially significant, to representative of clans, to mnemonic devices for long orations. Wonderley (2005) presents an interesting theory linking Iroquois cosmology and legends of creation to some of the composite pipes described earlier. For example, prior to about 1800 the Iroquois did not believe in humans being created by a divine creator but that that they came up out of the ground. Some groups, the Oneidas for instance could show you the hollow from which their ancestors emerged. Could this be what is represented in the Figure-in-Arch and Figure-in-Crescent motifs? Perhaps even the Dougherty pipe is related to this theme of emergence. According to the archaeological evidence of the region the proliferation of pipes occurs, “[between] the late prehistoric and the early protohistoric [periods, 1450-1500]” (Nobel 1979 & Mathews 1980). Funk and Kuhn (2003) suggest the Iroquois Confederacy grew out of an earlier alliance among the Mohawk, Oneida and Onondaga nations. Many scholars and ethnographic accounts agree that this budding alliance or “pre-league confederacy” began “in the late 1400’s and mid 1500’s” (Wonderley 2005) and eventually grew into the Iroquois Confederacy of Six Nations. It is Hosbach (1992) and Wonderley (2005) that suggest a correlation between this evidence and the ideas of birth and emergence to the iconography of some of the effigies. Could these pipes be evidence of growing alliances, political or economic, throughout the Mid-Atlantic region? It should be noted that most of this discussion has focused on effigy pipes recovered from sites in southern Ontario and upper New York State. 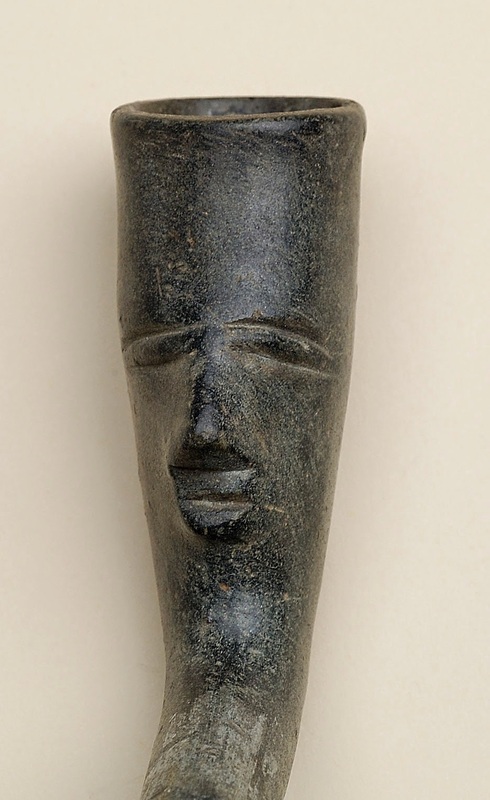 The images (unless otherwise noted) are from the collections of The State Museum of Pennsylvania and were primarily recovered from Susquehannock sites. 2003 Three Sixteenth-Century Mohawk Iroquois Village Sites. Philosophical Concept of Sexual Duality as Its Basic Motif. 1989 New Approaches to Other Pasts. 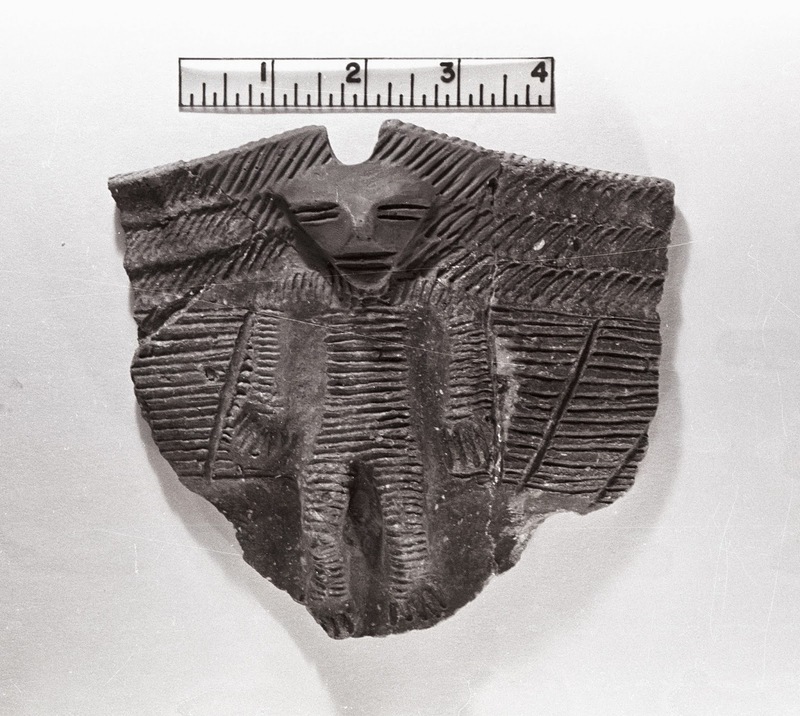 1980 Of Man and Beast: the Chronology of Effigy Pipes among Ontario Iroquoians. 1981 The Identification of Animals on Ontario Iroquoian Pipes. St. Lawrence Iroquoians and Eastern Iroquois in New York State.